Meet your Democratic nominee, Josh Harder, who accepted the nomination in CA-10 last week! Harder is a small business leader who teaches at Modesto Junior College. He’s campaigning on Medicare for All, immigration reform, and investing in infrastructure for the Central Valley. He also wants to overturn Citizens United, restore the Voting Rights Act and put an end to gerrymandering. His opponent, Republican incumbent Jeff Denham, voted to repeal Obamacare, voted for the GOP Tax Scam, and is against women’s right to choose. He’s also taken money from the NRA. On the subject of climate change, he says “nobody really knows the cause” and doubled down with a cynical and glib suggestion that “maybe we should kill the cows to stop the methane, or stop breathing to stop the CO2.” We say maybe he shouldn’t be a member of the House anymore! Make a contribution to Josh Harder’s campaign through Swing Left right now. Grassroots donors have already raised more than $200,000 for the Swing Left District Fund for CA-10, which has been given directly to Josh Harder’s campaign. Early money like this enables candidates to hire campaign staff, open offices, and buy ad time at a cheaper rate to help flip this important seat blue. 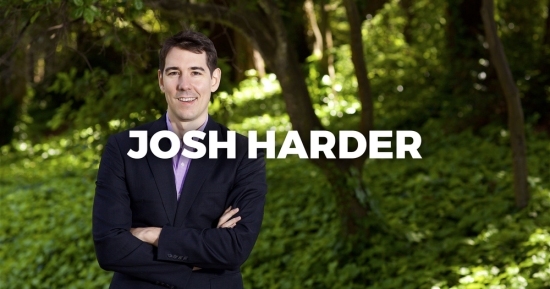 Make a contribution to Josh Harder in CA-10. Your donation will go directly to his campaign, where it can have the biggest impact. Stay involved. Forward this email to your friends and let them know about the official nominee for your Swing District. We’ll be in touch soon with more opportunities to hear directly from the candidate and volunteer to help the campaign win in November. P.S. Here’s Josh accepting his Big Blue Check. Let’s keep it going! Paid for by Swing Left, swingleft.org, and not authorized by any candidate or candidate’s committee. Copyright © 2017 Swing Left. All rights reserved.